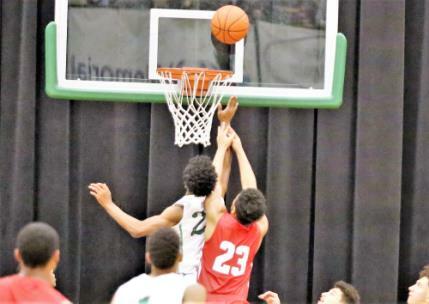 East Hamilton sophomore Darwin Randolph gets inside position on Ooltewah's Tarel McClurkin for a game-winning tip-in with seven seconds remaining Friday night as the Hurricanes beat the Owls, 52-51, in a thrilling District 5-3A basketball game at East Hamilton. Frank Jones, the first-year boys’ basketball coach at East Hamilton, knows all about heated high school rivalries from his playing days at powerful Riverside High School in Chattanooga. Take the 1972 basketball season. Riverside played bitter rival Howard five times that season, and the fifth meeting was for the 1972 TSSAA state championship and played at Vanderbilt University. Riverside won the first four showdowns. And with all the marbles at stake, legendary coach Dorsey Sims coached his squad to a 60-53 victory and its third state title. Riverside also claimed back-to-back titles in 1968 and 1969. It’s likely that Jones, his Hurricanes and jittery fans will have a harrowing, 52-51, victory over Ooltewah in etched in their memories for a lifetime as well. Fifteen-year-old sophomore Darwin Randolph tipped in Jamaal Walker’s errant 3-point shot with 6.7 seconds left to give the Canes (14-3, 6-0) the nail-biting triumph before a raucous crowd at East Hamilton’s gym. Walker, who had seven of his 12 points in the first quarter, had a different perspective on his final shot. At the halfway point of the district season, the Canes have already beaten Walker Valley, Cleveland, Ooltewah and Bradley Central – the next four teams behind East Hamilton the league standings – and all those games were on the Canes’ home court. That means just one thing. The rematches with those same squads will be on the road. Each team attacked the other with tenacity and determination. The Canes led by five points at halftime and the battle was deadlocked at 40-all after three quarters., thanks in large part to the Owls’ 12-2 run in the final 3:30 of the period. That spurt wiped out a 35-28 East Hamilton advantage. Logan Henry hit a layup to start the Ooltewah (11-8, 3-3) rally. Wood knocked down a 3 ahead of Walker’s three-point play for the Canes. Tarel McClurkin did Walker one better, drilling a 3 and sinking the ensuing free throw that pulled the Owls to within 38-37. Wood made a jumper and Jax Howard added a free throw. Morrell Schramm’s short bank shot at the buzzer tied the score at 40-40 going to the fourth period. “This game was similar to how we played during the summer,” Ooltewah coach Jay Williams said. “We’ve been trying to get back to that level. We expect to play well, but we demand our guys to play hard. It was a great atmosphere and the kids for both schools really came out. Ooltewah’s Julien Walker’s layup started the fourth-quarter scoring. Wood hit 1 of 2 free throws and Walker came back with a layup off a Howard assist. The Canes’ Deaunte Crawford hit a charity toss and Schramm jumper over Howard sliced Ooltewah’s lead to 45-44. Kevin Smith’s driving layup, the last of his two field goals, extended the Ooltewah lead to 47-44. Schramm countered with a layup midway through the quarter. Wood, who scored a game-high 15 points, came right back with an open layup and the Canes were down by three points with less than four minutes left. The game’s momentum then shifted harshly. Howard, a standout pitcher for the Owls’ baseball team, was called for a foul against Jamaal Walker and then slapped with a technical. Walker made both free throws and the Canes retained possession. Schramm tossed in two free throws and East Hamilton went ahead, 50-49. Ooltewah’s Walker was fouled and made both free throws. Owls up, 51-50. The Canes’ Ian Shropshire missed two free throws at the 1:39 mark. The Owls’ Henry, who drained back-to-back 3s earlier in the first quarter and finished with 12 points, also missed two chances at the charity stripe, and in the scramble for the loose ball East Hamilton got possession on a jump-ball call with 51.8 seconds left. The Canes ran the clock down and the last pass found Walker on the left wing. His shot was slightly awry. Randolph was Johnny-on-the-spot with the game-winning tip-in and in a matter of seconds the East Hamilton student section was in the middle of the floor wildly celebrating the Canes’ seventh win in eight games. The only loss in that stretch was a four-point setback against undefeated Baylor. Schramm paced the Canes’ offense with 13 points. Walker scored 12 points and Randolph 10. East Hamilton girls 71, Ooltewah 37: The Lady Hurricanes’ and Lady Owls played a game of two distinct halves. East Hamilton (13-7, 3-2) managed to build a 29-20 halftime advantage, thanks to Madison Hayes scoring the final five points of the second period. Hayes finished with a game-high 31 points that included three of the team’s seven 3-pointers. After the break, the Canes turned up the heat and outscored the Lady Owls (6-11, 1-5) and put up a 42-17 scoring edge in the final two quarters. “I give Ooltewah credit,” said East Hamilton coach Hunter Gremore. “They played us very physical and that’s the kind of game we like. We’re one of the best rebounding teams around, but every time we took a shot and pushed us around. We’re not used to that happening. The Lady Canes, who have beaten Baylor, McMinn County and Ooltewah in successive games by a combined 86 points, scored only eight points in the third period and still had a 47-29 lead heading into the final period. Ooltewah scored 11 of the first 17 fourth-quarter points and the final 13 of the game to extend the lead to rout proportions. Madison Hayes, McKenna Hayes and Emily Petitt each had 3s to start the last scoring spree. McKenna Hayes made two layups to finish it. Dezah Lacy scored 15 points for East Hamilton and McKenna Hayes added 10. Madalyn Mills paced the Lady Owls with 18 points and Annalee Cline finished with 14 that included four 3-pointers. Ooltewah (37) – Annalee Cline 14, Poland, O’Donnell, Hilliard, Thompson, Tharp, Wardlaw, Garcia, Brown, Madeline Mills 18, Daniels, Sutton Turman, Patterson 5. East Hamilton (71) – Patton, Evans, Dezah Lacy 15, Seder, Copeland 2, Madison Hayes 31, McKenna Hayes 10, Johnson, Petitt 7, Sue, Laboo 5. 3-Point Goals – Ooltewah 4 (Cline 4), East Hamilton 7 (Ma. Hayes 3, Mc. Hayes 2, Petitt 2). Ooltewah (51) – Greyson Wood 15, Smith 4, Howard 3, Houston, Logan Henry 12, Haynes, McClurkin 4, Williams 1, Julien Walker 12. East Hamilton (52) – Jamaal Walker 12, Montgomery 8, Morrell Schramm 13, Jenkins, S. Randolph 4, Shropshire, Darwin Randolph 10, Crawford 5. 3-Point Goals – Ooltewah 5 (Wood 2, Henry 2, McClurkin 1), East Hamilton 3 (Walker 1, Montgomery 1, Schramm 1). 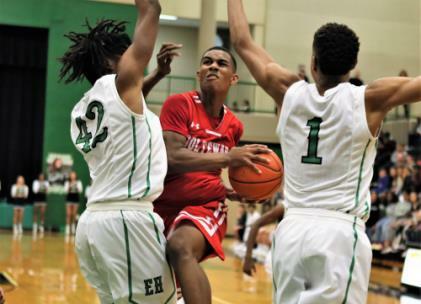 Greyson Wood, who scored a game-high 15 points, tries to get past East Hamilton defenders, Deaunte Crawford (42) and Jamaal Walker (1) Friday night during the teams' District 5-3A basketball game. The Hurricanes won, 52-51, and kept sole possession of first place(6-0) in the district standings.